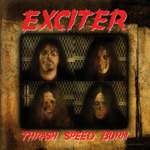 After an 8-year hiatus, Exciter returns with a new vocalist; Kenny Winter, and a new album; 'Thrash Speed Burn,' both capable of carrying on Exciter's Canadian speed metal tradition. Fans of the band will be happy to hear that despite numerous lineup changes, these guys haven't strayed far from the formula they've been comfortable with for the last 25 years. 'Thrash Speed Burn' is pretty much standard issue 80's speed metal, which is almost always worth a listen. Even the thin production makes this disc sound like it might have been released 20-something years ago. If you're new to the band, Exciter plays a style similar to early-Anthrax and Exodus. This particular album reminds me of Anthrax's "Fistful Of Metal' for some reason. - Maybe because new frontman Kenny Winter, sounds a lot like original Anthrax singer Neil Turbin. There might not be anything groundbreaking here, but 'Thrash Speed Burn' is a stable CD that should have ancient metalheads like me dusting off the classics. Unfortunately, if you're not into classic speed metal there probably isn't much on this disc for you. There might not be anything groundbreaking here, but 'Thrash Speed Burn' is a stable CD that should have ancient metalheads like me dusting off the classics. Unfortunately, if you're not into classic speed metal there probably isn't much on this disc for you.